Cloudy Lane looks set to try and continue the scintillating recent form of trainer Donald McCain when he lines up in the £65,000 Grade Three skybet.com Rowland Meyrick Handicap Chase (1.45pm), highlight of the first day of Wetherby’s two-day Sky Bet Christmas Meeting on Boxing Day, Friday, December 26. The Trevor Hemmings-owned eight-year-old, a winner at the Cheltenham Festival in 2007, enjoyed a superb campaign last season, notching victories in handicap chases at Haydock, Ayr and Doncaster prior to finishing his campaign with a fine sixth in the John Smith’s Grand National at Aintree in April. After coming ninth on his seasonal debut in a Grade Two handicap chase at Aintree in October, Cloudy Lane posted a better performance on his latest start when fourth to Snoopy Loopy in the Grade One Betfair Chase at Haydock on November 22. Cheshire-based McCain revealed today: “Cloudy Lane is very much a possible for the skybet.com Rowland Meyrick Handicap Chase and it is highly likely that he will line up in the race. “He’s also been entered in the Lexus Chase at Leopardstown two days later, but he is possibly not the best traveller in the world and so Wetherby is the more viable option, subject to a chat with his owner Mr Hemmings. 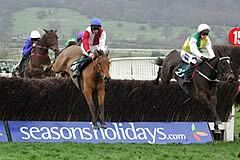 “He’s come out of his run at Haydock in grand form and the race has probably put him spot on for this week. He’s in good order and ready to run. I was both pleased and a little but frustrated with his performance in the Betfair Chase because, looking back, I don’t think it was as good a race as it could have been and if we were 100%, then we would have been knocking at the door. “That said, he still ran a nice race - he wasn’t knocked about and he has come on for the run. Obviously, his target for the season is the John Smith’s Grand National, but I would still like to run him in the top staying chases in the season and I would love to get his head in front somewhere, hopefully at Wetherby. A total of 25 horses have been entered for the skybet.com Rowland Meyrick Handicap Chase and the weights for the three mile, one furlong contest are headed by the Howard Johnson-trained Tidal Bay (11st 12lb), whose five victories last season included Grade One successes in the Arkle Challenge Trophy at Cheltenham and the Maghull Novices’ Chase at Aintree. Madison Du Berlais, who took the Grade Three Hennessy Gold Cup on his latest start, could take his chance for David Pipe, while another winner of the Newbury showpiece, 2006 scorer State Of Play, is likely to follow-up his recent Wetherby victory in the Grade Two bet365 Charlie Hall Chase, where he beat Grade One victor Ollie Magern, himself a dual winner of the bet365 Charlie Hall Chase. Course specialist Mister McGoldrick could bid for a ninth Wetherby victory and is one of three entries from the yard of Bingley-based handler Sue Smith, while champion trainer Paul Nicholls may rely on the ultra-consistent Nozic, who has only finished out of the frame in one of his six starts in Britain. Other notable entries include last year’s Hennessy Gold Cup third Character Building, Standin Obligation, Bible Lord and Always Waining, who was a comprehensive winner of a Listed handicap chase at Market Rasen on his latest appearance in September. While the skybet.com Rowland Meyrick Handicap Chase is the feature race on the first day of the Sky Bet Christmas Meeting, which is sponsored by Sky Bet for a seventh year, the six-race card on Saturday, December 27, includes the £30,000 skybet.com Castleford Handicap Chase (3.00pm), for which 10 horses have been entered. Trainer Malcolm Jefferson is planning to let Calatagan, successful in the race for the past two seasons, bid for a hat-trick in the two-mile contest, but the nine-year-old could face stiff competition from the likes of Grade Two winners Moon Over Miami and Stan, Haydock handicap chase scorer Medicinal and the Howard Johnson-trained pair of Santa’s Son and Locksmith. Advance bookings are selling well and racegoers are advised to book early to avoid disappointment, particularly for the Premier Enclosure, which is normally a sell-out. Tickets can be purchased at www.wetherbyracing.co.uk or by phoning 01937 582 035. Admission Prices (December 26 & 27): Premier Enclosure £27, Paddock Enclosure £16, Pick of the Paddock £21 (includes admission to the Paddock Enclosure, £4 Refreshment Voucher, £2 Tote Betting Voucher and Racecard), Pick of the Premier £38 (includes admission to the Premier Enclosure, 2 x £4 Refreshment Voucher, 2 x £2 Tote Betting Voucher and Racecard).